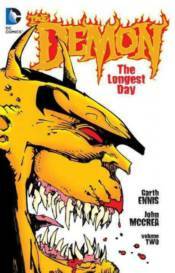 The Demon is back for more violent, over-the-top adventures in this collection, featuring never-before-reprinted stories, which feature the unexpected return of Merlin, who warns Jason Blood of Etrigan's demonic offspring! Then, The Demon and Jason Blood trick Captain Scumm into selling something he can never get back. And don't miss appearances by Hitman! Collects THE DEMON #49-58.